While perusing through pinterest I saw several versions of Taco Macaroni and Cheese. 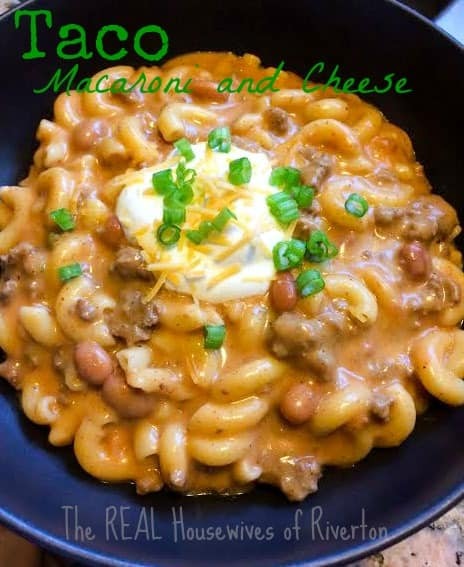 They kind of reminded me of homemade hamburger helper, so I decided to peek through my cupboards and find out what I had on hand to make my own version. My kids, like most, LOVE mac and cheese! If you let them pick what they want for lunch or dinner, at least half the time mac and cheese comes up. I personally really enjoy homemade mac and cheese and my husband isn’t really a big fan of any kind. Usually, I only make it when my husband won’t be home for dinner or if the kids are eating it for lunch. And because children don’t always appreciate the homemade version it’s usually the box version that they get. I figured this would be a great way to let them have their mac and cheese, but add more flavor so it might be something Josh and I enjoy too. We were not disappointed! It was seriously so delicious, we all gobbled it right up! I thought we’d have tons of leftovers and there was none! In a large skillet, brown your ground beef with your chopped green onions. Drain any fat. Add pinto beans, tomato sauce, and taco seasoning. Turn to low to keep warm, stir occasionally. While browning your ground beef, prepare your elbow macaroni according to the instructions on the package. Drain macaroni, set aside temporarily. In large sauce pan, melt your butter and whisk with flour. Add cheddar cheese soup and milk. Keep over warm heat and bring to a simmer. You don’t want to scald your milk. Add in shredded cheese and keep whisking until cheese is melted. Add macaroni to the cheese sauce and mix until well covered. Next add the macaroni and cheese to your ground beef mixture. Stir well to combine all ingredients. Top with sour cream, garnish with shredded cheese and onions. Enjoy! This is such a great recipe…two of our favorite things in one! My boys (and me too) will devour this…going on our next meal plan!